In 1894, the Colorado millionaire David Swickheimer and other prominent business men in East Texas formed the Bay City Town Company. Hoping to take advantage of the fertile lands surrounding the Colorado River and Caney Creek, the men purchased 640 acres of cow pasture in the Bay Prairie to construct a new seat for Matagorda County. The city planners selected one square mile as the city center, a space conveniently located two miles from Elliott’s Ferry, which transported people and goods across the Colorado River. Located in a fertile agricultural zone with access to river and railroad transportation, Bay City stood at the cusp of the 20th century ready to become a thriving town along the southeast Texas coast. Jewish settlers had lived in the Bay City area long before there was a Bay City, and a small Jewish community remains today. Before Swickheimer and company purchased the land for Bay City, Jewish settlers came to the region and substantially influenced the development of the area. After the death of his wife in 1835, Dr. Albert Moses Levy visited his family in New Orleans and heard talk of Texas’ war for independence from Mexico. Levy joined the Texas Navy during the conflict, and went to work aboard the Independence early in 1837. When Mexican forces captured the ship, Levy and his fellow soldiers were imprisoned, but Levy escaped the prison after three months. Texas awarded Levy numerous tracts of land for his service, but he decided to make his home on the “one league and one labor of land” that he received in Matagorda County. Levy opened up a successful medical practice in the area that assisted many people in Matagorda. Despite his professional success, Levy committed suicide in 1848. Most believe that Levy’s suicide was a result of his Jewish family disowning him for marrying an Episcopalian woman and converting to Christianity. Although Levy’s family may not have considered him an exemplary Jew, the city of Houston declared April 30, 1986, as Albert Moses Levy Day to honor all of the Jews who fought for Texas’ independence. After voters in Matagorda County agreed to make Bay City the new county seat in September of 1894, the city grew quickly and offered many business opportunities to Jewish merchants. The town received its first telephone in 1900, and Bay City Rice Mills opened up a rice warehouse in 1901 and a mill the following year. The ex-Confederate Michael Sternberger observed the growing population and thriving businesses in Bay City and decided to invest in the new town. Sternberger moved from Port Lavaca to Bay City in 1902 and established a dry goods store, using Bay City’s proximity to the Colorado River to transport his goods. Sternberger was a very successful merchant while he worked in Bay City, and when he died in 1912 the local newspaper called him “one of the leading and most prosperous merchants of this section of Texas.” Sternberger provided a large part of the financial investment and community spirit necessary for Bay City to flourish in its formative years. As Bay City grew in both size and population, Jews that had recently immigrated to the United States moved into the town to take advantage of new markets. Around 1910, Henry Schwartz and his brothers moved to Bay City from Schulenburg, Texas, and opened up another branch of the Schwartz Bros. Horse and Mule Company. Henry Schwartz died in 1916 after he was taken to a San Antonio sanitarium for a nervous breakdown. Around the same time, Russian-born Aaron and Haskell Simon moved to Bay City after immigrating through Galveston in 1904. According to the 1910 Census, Aaron and Haskell first worked as clothing peddlers in Bay City, but by 1920 the Simon brothers had opened their own clothing store and offered a job to another brother named Nathan. S.O. Eidman opened up a book store and confectionery in 1908, a store the local paper recognized as “the only magazine and newspaper distribution center in the city” at the time. After leaving Poland to escape conscription into the Russian army, Pincus Kogutt immigrated to Galveston in 1912 and learned the shoe repair trade from his brother-in-law. The ensuing battles of World War I prevented Kogutt’s wife and his children from coming to the US until 1920. Despite this separation from his family, Kogutt mastered the shoe repair trade and moved to Bay City to go into business for himself. Kogutt bought a home at 2509 Avenue H to house his family, and eventually was able to move his shoe repair business from his house to another building. Customers were very fond of Kogutt’s shop, and many recall that Kogutt was able to remember each customer’s shoe size. Although Bay City may not have been the point of entry for many new Jewish immigrants, the city ended up becoming the longtime home of Jews attracted to the city’s burgeoning economy. The prosperity of the 1920s encouraged a wave of Jewish immigration into Bay City. Joe Denn left Austria-Hungary in 1920, immigrated through New York with his wife Bertha, and came directly to Wharton, Texas, where Bertha's brother Joe Schwartz lived. The Denns bought a fruit stand in Wharton, and then moved to Bay City in 1924 to purchase M. Kasman Grocery. Joe Denn became a naturalized citizen in Bay City, and helped the rabbi conduct High Holy Day services in Wharton until Denn's death in 1981. Though the merchant class in Bay City was largely dominated by Jewish men, Esther Goldman, a sister of Bertha Denn and Joe Schwartz, operated one of the most successful stores in Bay City on her own. Esther and other members of her family migrated to New York from Slovakia in 1910. Esther married Julius Goldman and moved to Wharton, where her brother had set up a successful dry goods store. Looking to go into business for themselves, Esther and Julius moved to Bay City in 1925 and opened J. Goldman Grocery. Julius and Esther divorced in 1927, and Esther took control of the store, renaming it E. Goldman Grocery to indicate the change in management. Esther ran a very successful business and let her nephews Herman, Sidney, and Manuel Denn start their business in a corner of her store in 1947. The Jews that came to the area in the 1920s were also heavily involved in the larger community. In comparison to his native land of Romania, Aaron Greenberg called Bay City his “true utopia” after he moved there in 1929. Greenberg went into business with J.S. Oshman, the owner of Oshman Dry Goods on Seventh Street, and committed himself to bettering Bay City. Greenberg was the first Rice Festival chairman, and he and his daughter Henrietta helped to establish the Texas Lions’ Crippled Children’s Camp. In recognition of his commitment to the community, the Bay City Chamber of Commerce named Greenberg “Citizen of the Year” in 1957. Jews may have come to Bay City in the 1920s to take advantage of the economic opportunities there, but they worked actively to give back to the community that supported their success. While the Great Depression presented numerous obstacles to Bay City Jews, the economic downturn proved a mixed blessing for the Epsteins. Max Epstein’s business in Kingsville could not sustain both him and his business partner, so Epstein took a Missouri-Pacific train bound for Houston in 1931. The train broke down in Bay City, and Epstein explored the town while mechanics repaired the train. Epstein saw that Simon Brothers was for sale, and decided he would try to fill the void left by the Simon merchants by opening up a clothing store with Harry Rosenzweig from Houston. By 1938, Rosenzweig’s took up three buildings in the town center and was the first air conditioned store between Houston and Corpus Christi. Max Epstein died in 1945, and his widow Ida continued to run the store with the help of her sons. Leon Guzick left a job in Houston to join the Rosenzweig’s staff, eventually working his way up to purchasing shoes and men’s and boys’ wear. Each year that he worked at the store, Guzick put on a Halloween party for all Bay City children at Rosenzweig’s. Raye, the daughter of Pincus and Leah Kogutt, also worked at Rosenzweig’s during and after high school. 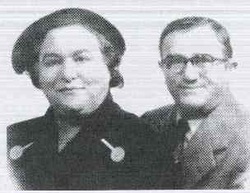 Guzick and Raye married in 1934 and had four children. While the Depression dealt many hardships, Bay City Jews weathered the storm with careful business planning and growing families. By 1937, an estimated 80 Jews lived in Bay City. World War II interrupted the tranquility previously enjoyed by Bay City’s Jewish merchant class, but also brought new Jewish residents to the area. After graduating high school in Bay City, Joe Denn’s son Manuel joined the US Army; Manuel went from enjoying five-cent sodas in his father’s shop to fighting in the Pacific Theater. The army stationed Manuel Denn at Cebu Island and in the Philippines, and also sent him to join the American forces occupying Japan after the war. In 1946, Manuel Denn returned to Bay City and went back to work at his father’s store. The Kogutts received the devastating news that all of their family members aside from two of Pincus’ brothers were killed in Nazi Germany; one of the surviving brothers moved to Galveston to be closer to his family in Bay City. David Krumholz from Tyler, Texas, served in Paris under General George S. Patton and received an award from General Charles De Gaulle. Krumholz retired as a lieutenant colonel and moved to Bay City to open David’s Firestone Store downtown. In 1945, Isaac Neuman purchased the old Eidman confectionery and turned it into a dry goods and clothing store. Neuman said in a newspaper interview that Bay City was “the most logical spot in Texas for future growth and development.” Like Neuman, observers and veterans of the war identified Bay City as a comfortable place to go on with life after the violence of the war. With the cessation of the war and the arrival of new Jewish residents, the Bay City Jewish community turned its attention to developing its religious life. While Bay City was the epicenter of many Jews’ business investments, Wharton, Texas, remained the site of religious worship. Most of the Jews in Bay City traveled the 18 miles to the Shearith Israel Congregation in Wharton to attend rabbi-led services and to bring their children to Sunday school. Furthermore, Jews that died in Bay City were almost always buried in the Jewish cemetery in Wharton. 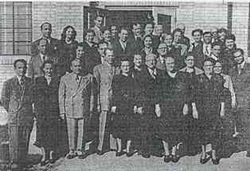 However, the Jewish community in Bay City decided to bring their religious life closer to home in 1947. Aaron Greenberg, Esther Goldman, the Kogutts, and Joe Denn led a campaign to build the Beth David Center, and the building was finished on December 4, 1947. Greenberg served as the first president of the center, and he told the local newspaper specifically that the center “is not a synagogue…but a place for our people to have Sunday school and lay meetings.” While most Jews continued the trek to Wharton for rabbi-led services on the High Holidays and other special occasions, Bay City Jews used the Beth David Center to foster community solidarity and to pass on religious knowledge to their children. They would hold lay-led services on Friday nights at the Center, although they did not have a Torah. The Center also worked to raise awareness outside of the Jewish community. For example, the Center raised $1,000 and donated it so that Bay City’s eighth graders could visit the Holocaust Museum in Houston. Around 1982, the members of the Beth David Center decided to sell its building since its property had become so valuable. Soon after, they bought land and built a new center on Nichols Street, which they dedicated in 1987. Jews continued to shape the business and civic atmosphere of Bay City throughout the later half of the 20th century. After taking over their Aunt Esther Goldman's business, brothers Herman, Sidney, and Manuel Denn expanded Bay City Surplus and Sales, which later became Denn Brother Sporting Goods. They opened up an additional store called Denn’s Silk Screening in 1983. In keeping with the example of Esther Goldman and Ida Epstein, the wives of the Denn brothers went into business, selling antiques and accessories at Nichols Street Furniture. The wives also purchased the House of Bargains in 1965. Along with expanding their family’s business interests, the Denn brothers each served as the president of the Beth David Center and helped lead the campaign to build a new synagogue in Wharton. Though greatly reduced in number, the Jewish community has not stopped serving the Bay City community. People in Matagorda County still remember the “Shell Lady,” Henrietta Krumholz, the wife of David Krumholz. Henrietta Krumholz spent several hours a day creating crafts with shells, a hobby she started with her children when they took trips to Matagorda Bay. Libraries, museums, and other institutions accepted Krumholz’ crafts as donations and sold them to raise funds for their programs. Krumholz passed away in 2015, at the age of 96, but her memory continues. In an interview with a local news station, Krumholz identified herself as one of the “good Jewish people practicing our religion,” exemplifying the spirit of civic responsibility and community dedication that Jews in Bay City have maintained since the turn of the 20th century. Since the 1990s, Bay City Jews have used the Beth David Center for occasional services and social gatherings. In 2012, the small group was still meeting once a month for dinner and a general meeting.